While hardwood floors are a great addition to your home for a variety of reasons, many buyers often ask if pets and hardwood floors mix. Have you ever said something along the lines of: “I want hardwood floors, but I’m afraid my pets will ruin my investment by scratching it all up”? If so, you’re not alone. The good news is that yes hardwood floors and pets do mix, and they can mix very well. Whether it be large dogs, small dogs, or cats, the trick is to limit the amount of damage that could be done by staying proactive with these tips. 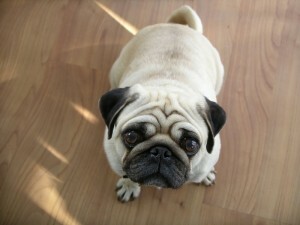 As obvious as it sounds, keeping your pet’s nails constantly trimmed is your best bet to long-lasting hardwood floors. This is especially important if you have a large dog (i.e. Labrador) as larger dogs carry more weight, which can really scratch up your beautiful hardwood floors. You can either do it yourself or have a professional dog groomer perform the task for you. If you have high energy dogs that like to take off running because they heard a noise or heard someone at the door then it’s best to keep them situated in an area where you may not have hardwood flooring, such as the kitchen. If your house permits, it may be worth investing in a dog gate that can separate your dog from areas that you do not want scratched up. Dogs love to go outside; it’s one of the few things that they truly look forward to (besides food and a good belly rub of course). If you have a dog that is constantly going in and out of the house, then it would help to place a mat outside so that it can pick up some of the dirt and other debris before coming back inside. This will only help a slight amount so it’s important to make sure your dog is bathed from time to time in order to get the remaining debris out of their hair, especially their feet. You don’t want them tracking their garbage everywhere. Rugs go a long way in preventing scratches on hardwood floors. By covering up areas where your dog is likely to be a majority of time with rugs, your hardwood floors can stay in tip-top shape for a long time as well as add a nice touch to your floor. Denser woods have a lesser chance of being ruined by the force of larger dogs. So how do you find out how heavy certain hardwood floors are? It’s actually quite simple thanks to the Janka Hardness Test. This test measures how much resistance certain woods can take. The ideal choice would be to choose a harder wood such as Hickory because it’s not only heavy, but features a lighter color as well. Lighter colors have a natural tendency to hide any scratches that may arise. Cats are light and therefore do not cause much concern when it comes to hardwood floors. Their sharp claws only come out as a defense mechanism, when they’re playing with certain toys, or if they’re using a scratching post. If you manage to keep their scratching post and toys in an area that’s away from your hardwood floors or in an area covered with rugs, then you shouldn’t have any problems with cats. I’d be worrying a lot more about that nice sofa you just bought! Another great perk to having hardwood floors over carpet flooring is when it comes to the vomiting, urinating, or defecating that may arise from your pets. With carpet flooring, these annoyances become even more annoying when they not only stain the carpet, but also embed their smell into it as well. Nobody wants to deal with that. With hardwood flooring, these annoyances are only slightly temporary and require a quick and easy clean up before you’re back on your way.